Is all your canning done? i guess this is my first reply in this forum im from BC Can. Welcome to the files. Growing up I spent alot of time in BC. Made it up to Kamloops a few times but not sure if we ever made it over your way. Most of my time was spent in the Vancouver area or on the island. Safeway has country style ribs for 98 cents a lb so I picked up some this morning. I grilled it up along with some chicken and canned 10 pts of it. It was advertised as bone-in but mine was all boneless. I did add BBQ sauce to one jar and also canned 2 pts of chicken with the sauce. It's been too cold up here this summer for everything to grow, my tomatoes are still small and green and my pepper plants just started to flower. the only thing that took of so far is broccoli, which is already done and eaten. How big a family do you have? I can picture 210 quarts and that is scary. Location: Tarpon Springs, Fl. / Jax. Fl. We need to come up with a way to re lid a "tin"- metal can.......any ideas? Tyler Durden: In the world I see - you are stalking elk through the damp canyon forests around the ruins of Rockefeller Center. You'll wear leather clothes that will last you the rest of your life. You'll climb the wrist-thick kudzu vines that wrap the Sears Tower. And when you look down, you'll see tiny figures pounding corn, laying strips of venison on the empty car pool lane of some abandoned superhighway. So far my little garden has yielded us 21 pints of tomatoes, 18 green beans (I cut up red potatoes into the jars, too), a couple quart bags of cut up frozen okra for soup and gumbo this winter, 3 cups of dried crowder peas, half a dozen or so eggplants (nasty stuff), a bunch of yellow squash, and many, many tomatoes for BST sandwiches (bacon, spinach, tomatoe). My fall peas are up and doing well if I can keep the rabbits and deer out of them. Chicken poop is wonderful stuff- even when it's applied "live" while debugging the garden. All of my canned meats are game meats because I get as much as I can use virtually free- mostly venison and turkey. All are pre-cooked, because that's what Grandmother's notes with the canner say! Mostly now what I'm canning is completed meals. Chili, stew, gumbo (fille' gumbo, I loathe okra), etc. I have enough meats put up to feed half the state. Grandmother's notes say pre-cook to reduce cooking required for use. Makes sense for an emergency, too. Cooking for 15 minutes is one thing. Cooking something for 1hr to cook it from raw to eating takes a lot more fuel. Always do what Grandmother says! I box my quarts up in cardboard boxes for storage to keep out light. I put 2 layers of cardboard between the boxes to stack and write an inventory on each box. I wonder about storing wheat, flour, cornmeal, sugar, etc in canning jars? More expensive than 5gal buckets, but quart jars might be handier quantities. I wonder if there is a way to seal these with vacuum? If you are a veteran, the oath still holds. Defend the constitution, or be forsworn! There are ways to do this but as with most of the home canned goods you have to have a dark storage area. The first is to use an 02 absorber with a little headspace. I have learned that if you go this route there are some precautions. A warm seal works better than a cold one. I have had a few that lost there seal. warm the entire contents and jar to 160-170 and then seal with a band. The trick is to get it warm enough to pull a vacuum but not hot enough to effect the contents inside except for the short time. Go to the top of pikes peak and pack all your jars. return to sea level. You will have a vacuum. The army has a research facility on the top of PP and one year they returned to MA and had one piece of equipment that did not have a pressure relief valve on the case. They could not get it open. Got some of it canned. The dark jar in front is a test. Albertsons had sausage on sale for $1 a roll. So I grilled some up and will try it out when I get back from Cleavland next week. I'm only half-joking here but how about replacing the old rubber seal with high heat RTV? I might have to try this with one of my old lids on some canned water to see if it seals. Hi to all canners. I only learned to can (still learning) three weeks ago. Just finished 11 quarts of peas tonight (morning) total 35 quarts. Pear preserves, 42 pints. 30 of them have oranges, lemons, raisins and pecans. Umm Umm ! Tomorrow 20 more pints of the plain ones. Not as hard as ya thought. 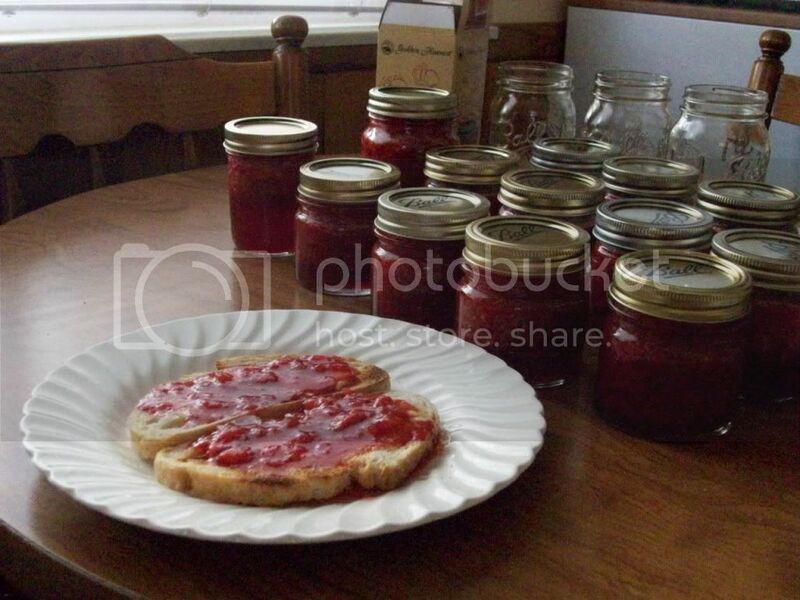 I just did up a batch of my Peach/strawberry jam a couple of days ago. Bread and butter pickles done today. The jars are pinging as I type. We had a freak freeze last night and these cukes were salvaged, only a few of the smaller ones froze and were unusable. im glad that my garden is done.. in aug i had only one day off of cannining ..we went thru 4 cases of lids..green beans tomatos pickles pickeled beans pickled beats salsa tomato juise whole tomatoes canned hot dogs blackberry jam corn and creamed corn ..canned hot peppers tomato paste. grean tomato relish ..plus weve dried bean s of all types peppers carrots..we grow shitokie mushrooms that we dry as well we even made canned corned deer meat.. we had crop damage permits so we already had a bunch of canned deer meat ....iv done a bunch of canning this year and as we own a gas well it dont cost us that much ..
No refrigeration, just seal them(with rings and boiled lids) as soon as you pour the boiling brine over them. Cut up peppers as you see fit, I make rings from mine, or cut in half lengthwise. Whole peppers don't work. Pack as many peppers as you can get into the jars while keeping 1/4" down from top. Boil brine, pour over peppers, seal promptly(lids should draw down). Let sit at least 6 weeks before eating. I've been eating these peppers and they are phenomenal. Thanks again for the recipe! Will this work with a little less vinegar and a little more water as they are strong? I'd hesitate to change the recipe. The acid is what keeps the little nasties out of the food. 4 cases of lids???? That is nearly 3000 jars. I thought I had a problem. I rarely use a whole case a year. something like 288 lids per case or flat .. just did 140 qrts of deer meat ..
My lids come 720 or 1440 to the case. You made me feel like an under achiever for a minute. How many are you feeding? Do you can everything, or have a root cellar too? I grilled some sausage patties and canned them with broth. Upon testing I found the texture too soft. Can I safely can them without the broth? What are the proper practices for cold packing meats, cooked or uncooked? "A viler evil than to murder a man, is to sell him suicide as an act of virtue"
"A human being should be able to change a diaper, plan an invasion, butcher a hog, conn a ship, design a building, write a sonnet, balance accounts, build a wall, set a bone, comfort the dying, take orders, give orders, cooperate, act alone, solve equations, analyze a new problem, pitch manure, program a computer, cook a tasty meal, fight efficiently and die gallantly. Specialization is for insects." PBR Streetgang, just curious. Does Big Red help with the canning? I want to be more like me. Under cook them a little. then can with 1TBS of water per pint. when you reheat them finish the browning in the pan and they will be better. Heading to my garden center today to pick up my starts. Tomatoes, lettuce, peppers, cucumbers and a few others. The ground is ready and waiting for another season of growing. "Just because you're right doesn't mean I'm wrong." Great thread everyone! It got me very interested in this particular method of food storage. Spent all winter reading as much as I could. Found a pressure canner on craigslist and have been picking jars and lids on the cheap through the winter. To those in the Great Lakes area: Mejier has all of their canning stuff out. Lids, rings, tools, pectin, and of course jars. Pretty good prices for in town. I drive over the road and don't have time to garden, so I will be stocking up when the prices are good and when I can make it to the Farmer's Market. So far it has been a blast! Detroit: A Socialist utopia at it's finest! They are there only to keep the lid on while processing and serve no purpose (other than to rust from the trapped water) after. "Remember man as you pass by, as you are now, so once was I. As I am now, so you shall be. Prepare for death and follow me." After the jars and the rings are utterly dry, sometimes I will put the rings back on to protect the seals if traveling, like a camping trip or something. But Jerry is correct, the rings do not need to be on the jars after the jars have a good seal. "How a politician stands on the Second Amendment tells you how he or she views you as an individual ... as a trustworthy and productive citizen, or as part of an unruly crowd that needs to be lorded over, controlled, supervised, ... or "taken care of." Location: Used to be Alabama and Germany, now Ohio. parisofthewest - It looks like the canning bug has bit. Looking at the picture - it looks like some of the strawberry jam may have foamed a little. a pat of butter can cut down on the foaming when the strawberries/sugar/pectin are heating up. That's what I do when making strawberry jam. There is more I want to start canning, but now to wait on more canning lids to arrive. Just ordered 360 more regular lids. "To show you how radical I am, I want carjackers dead. I want rapists dead. I want burglars dead. I want child molesters dead. I want the bad guys dead. No court case. No parole. No early release. I want 'em dead. Get a gun and when they attack you, shoot 'em." Try deer - elk - pork (at $1 a pound) - and chicken (on sale) - for your canning. You will be surprised at how good it tastes on the other end ..
Getting some protein in the jars is a good idea. The Fal fest attendees have never complained. This year it was turkey, chicken and beef. Last year was turkey and pork. My beef and pork I grill first before canning. Just a light grill to add some flavor. Chicken and Turkey are a no brainer. Turkey comes on sale once a year for 25 cents a lb. I canned 2 20+lb birds last year. We go through a ton of chicken and only have a small freezer. any time it is between 1.29-$1.50 per lb for boneless breasts I buy, then I can. I have to add something here. At the latest FAL Fest, jerrymrc had some meat in jars all canned and ready to cook. I was surprised to see that some of the jars were just about half full - and I asked about it - but Jerry said it is not unusual to process less than full jars. Well, I'm still here and I sure as hell ate a bunch of the stuff he was offering. definitely a good idea. I wish they would put chicken or beef on sale here, but the commissary doesn't run to many killer deals like the grocery stores in the states. 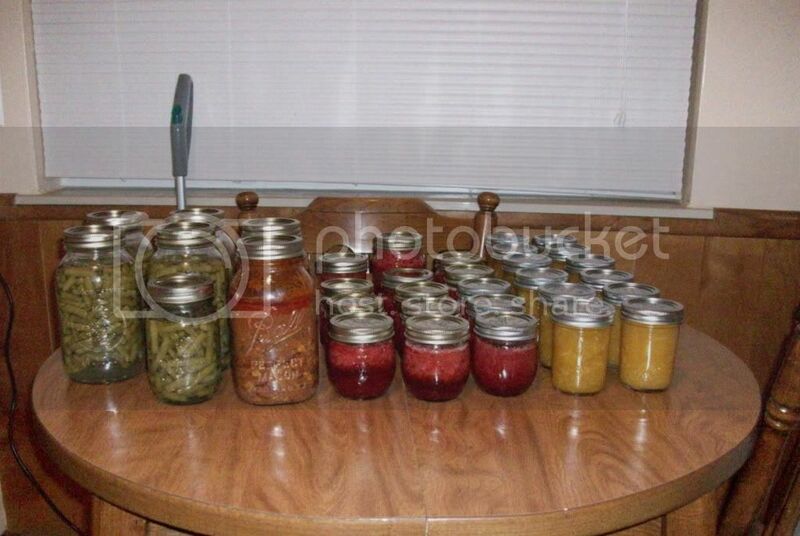 So until I get back to the states sometime next year, I'm just canning up some fruits and vegetables. My dehydrator gets a good workout as well (dried a little over 300 plums last year, as well as other fruits). I can hardly wait to get to hunting again and putting some wild game into the freezer/jar. Thanks for the info on the rings Jerry! I will try the butter next time with the jam Sniper, thanks. I need to get a little more practice with the pectin...the jam turned out a tad runny but was awesome on toast and pancakes. How come no one is canning rhubarb?? How about a recipe for this delicacy? What gives?? We were lucky around here this year, because the rain didn't hurt the rhubarb. Jerry did you ever try that Salmon I gave you at the OR. FAL Shoot ? Yes we did and it was very good. Glad you liked it ! I've got 212 qt of greenbeans, 96 pints of kippered salmon, 36 pints off red respberry jelly, 36 pints of blackberry jelly, to much tomatoe sauce and salsa and ketchup, 36 pints of hot pepper relish, 36 gallon bags of cabbage, two 5 gal buckets of kidney beans dried and sealed, two 5 gal buckets of rice sealed, 9 cows in the pasture weighting from in the heifer, 80 lbs bottle calves to 1200 lbs ready to cut up can and freeze, three nigeran goats milk cheese and butter mmmmm, 24 hens and one rooster for layers with six dual purpose birds for meat. I hatch out around thirty birds for slaughter every spring, carrots, potatoes and onions in the spring celler oh ya corn, canned, creamed and frozen. My goal two years of only going to the store for spices and odds and end when needed. Longer if required. I have feed a family of six for the last three years for less then $300.00 a month my goal is zero. If i do away with pop, chips and junk i can do it now. I love it! Sounds like you are well on your way to being more self sufficient than the majority of people. That is definitely something to be proud of. Well, I finally broke the canner out (after having it for about 4 years) and canned some green beans. My buddy has used it for soups/stews, but I had not canned anything with it. It's nice to be able to stack 16 pints in this canner. Next up will be some venison. Got a little in the freezer that is from the year before last, so I'll try it and see how I do with it. US out of the UN!! UN out of the US!! 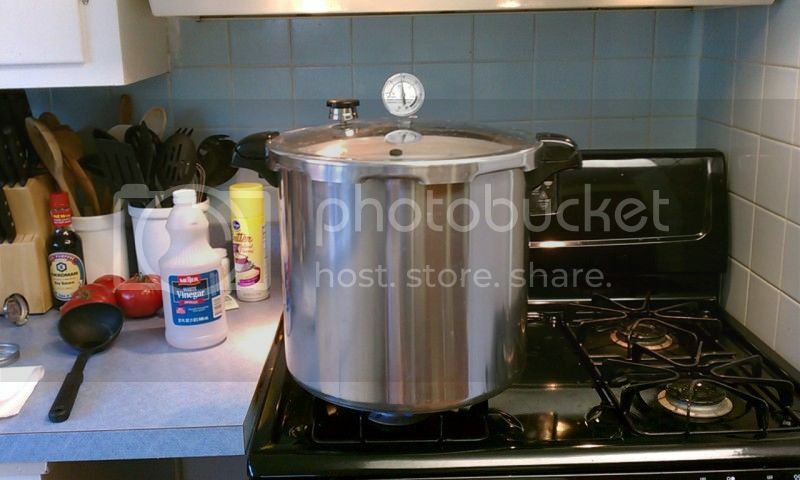 If that's the same Presto canner I have, you can fit 20 pints at a time. Is it 16 quarts? I just got my All-American 15.5 quart canner and the ball blue book. I've been studying videos on Youtube, and reading and am going to can my 1st batch of chicken tomorrow; for food security (just me and the wife) price cost-averaging. Picked up about $50 of boneless/skinless chicken breasts at Costco $2.99/lb so I can get started asap, from now on though I'll be watching those Wednesday ads that I usually just throw away. Plus I'm going to re-read this thread start to finish! Thanks for all the pics and info. It is the 01781 model, 23 qt. Not sure if more than that will fit, but I'll be trying now! Last edited by C-ya; August 30, 2011 at 21:42. You should be able to get 10 and 10. I wouldn't put less than 10 in the second layer though as the jars can tip and spill. I'll have to try that with some empties just to see how many will fit. What a great thread. I have a small orchard on my property, just a couple of apple and plum trees. The trees hadn't been maintained for probably a decade or better, so we pruned somewhat harshly this last spring. That apples came back in strength, but almost all the fruit has been riddled with bugs before it's even ripe. The plum trees are much slower to recover, oh well next year. 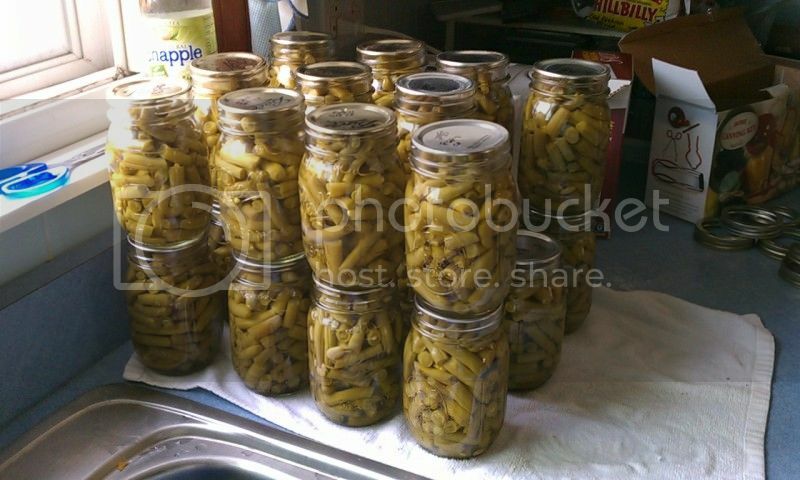 I've also got a recipe for pickled green beens, which I am absolutely addicted to from my aunt. I think she's won the state fair with them a few times.